Fairfield should note with pride that it is among the statewide leaders in residential solar installations, 189 at last count, placing it in the No. 2 spot behind Milford. But that wasn’t good enough for three intrepid Fairfield Warde High School seniors, who decided to help Fairfield get to the top. There has never been a better time to go solar. Last fall, the town’s Clean Energy Task Force, of which I am a member, felt that it could convince more Fairfielders to go solar. Connecticut receives very ample sunlight. Solar panels are efficient, reliable, and maintenance-free. But the key reason is that installation costs have dropped to the extent that — and I say this with no exaggeration — homeowners can’t afford not to take a serious look at solar power. Add federal tax credits, state rebate programs and available leasing plans, and home solar power becomes as close to a no-brainer as you can get. I’ve been solarized since January 2011, and I haven’t paid an electric bill since. There’s a catch to solarizing, though: a house needs to be properly oriented and relatively unshaded to make it worthwhile. So, spurred on by a Community Innovation Grant that had been awarded to the town by the Connecticut Green Bank, the CETF devised a three-phase project: first, identify homes that were good candidates for solar installations; second, inform those homeowners of the opportunity, and third, partner with a reputable solar installer to offer discount group pricing to interested homeowners. Finding a solar energy partner was easy. Direct Energy Solar, whose predecessor, Astrum Solar, had been selected to be the vendor for a successful pilot project in Fairfield, was happy to participate. But it was the first two phases that were the major obstacles. Identifying homes that would be likely candidates for solar power, and then informing them would be a daunting, labor-intensive challenge. CETF’s chairman, Scott Thompson, got a suggestion for an idea to get help. He contacted Tim Foster, who teaches the AP Environmental Science class at Fairfield Warde High School, to ask if he would describe the project to his class, and see if anyone was interested in being project interns. Katey McCarthy and Quinn Igram raised their hands. 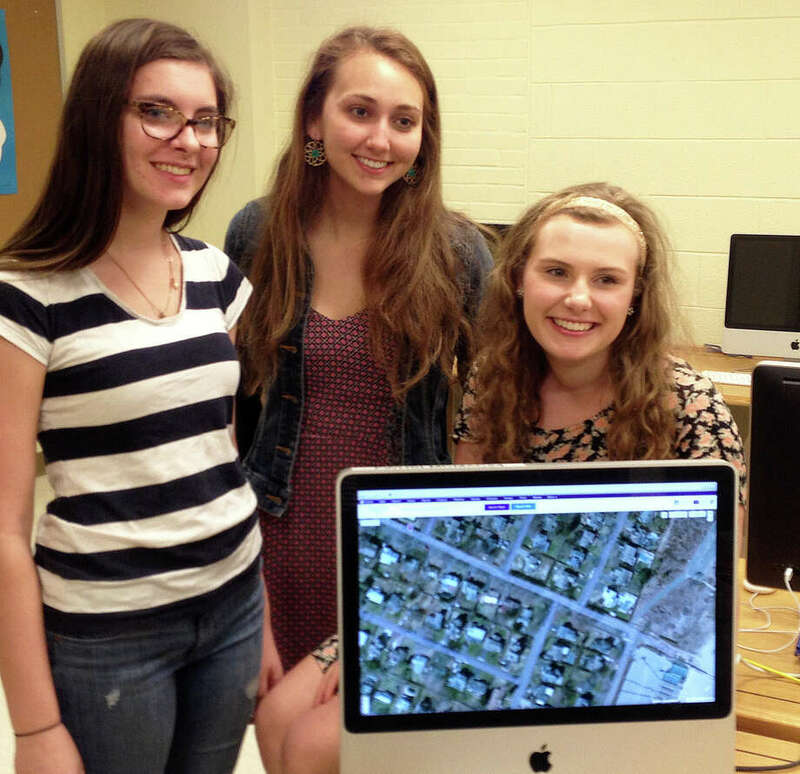 Emma Vahey, who was not in that class, joined the project team, as did two other students. Widely available, free programs like Google Earth produce amazingly high-resolution aerial views of almost anywhere on the planet. So, doing a virtual fly-over of Fairfield rooftops wasn’t going to be too hard. The problem was to systematically pick out the homes that met the criteria of roof orientation and lack of shading. In looking at this project, two sayings come to mind, which I will paraphrase: “A journey of a thousand miles begins with a single step,” and “Game plans are great until you start the game.” The initial Fearless Five were handed an intimidating list of 16,000 Fairfield home addresses, and they quickly took their first steps. Each of them, in their spare time, would make about 3,000 individual Google Earth assessments of each home’s solar potential. A big, job, to be sure, but the team would push through with a clear game plan and a solid tool in Google Earth. But then the game started, and the game plan started to unravel. Two students had to drop out; the Fearless Five suddenly became the Threadbare Three. In addition, it turned out that Google Earth often couldn’t specifically identify a given address, slowing the process considerably. Katey, Emma and Quinn did not give up — they changed the game plan. They redistributed the workload, and looked for ways to make the process more efficient. Quinn discovered that Yahoo Maps could pinpoint the specific rooftop linked to an address. Although they usually worked separately, they kept in touch (usually via text, of course), exchanging tips to improve everyone’s performance. Their friends questioned their sanity. But 16,000 searches later, The Three had identified about 4,000 candidate homes. But the project was only half done; these homes needed to be informed of their solar potential. So, they composed an informational letter, and using Fairfield Warde stationery, hand-addressed 4,000 envelopes for each household. About half of those envelopes were mailed in April, and the rest were mailed last week. CETF’s project interns are coming away with important life lessons: the value of teamwork; the ability to overcome adversity; a deeper understanding of an emerging energy technology. But the most important lesson for them is that tackling a huge project like this can have a huge payoff. Already, the project has produced more than 50 interested residents, and 10 sales. I passed this news on to Katey by phone the other evening. I’m sure she spoke for The Three in expressing her excitement at the tangible outcome of their efforts. These kids are heroes. Their long, undaunted slog to see this project through is a tribute to them, and to Fairfield. If you get a hand-addressed envelope with a Fairfield Warde return address, open it! It’s a gift to you from Katey, Emma and Quinn. Want to hear more from Fairfield homeowners who have gone solar? There will be a solar open house at 165 Stonewall Lane on June 20 from noon to 2 p.m. The town also will host an informational workshop on June 24 from 7 to 8:30 p.m. at the main branch of the Fairfield Public Library. Visit http://go.directenergysolar.com/fairfield for more information. Ron Blumenfeld is a Fairfield writer and retired pediatrician. His "As I See It" column appears periodically. He can be reached at: rblumen2@gmail.com.